Poor old Mother Goose and her family are being thrown out of their humble cottage by the Squire of Merrilea. The Fairy Queen decides to help her out by sending Priscilla, a magical goose, who proceeds to lay golden eggs. But can these great riches bring Mother Goose lasting happiness? Since no one actually knows the story of Mother Goose, this is a pantomime which you go to in hope rather than expectation. The Norman Robbins version of the tale was served up by The Guild Players on 10th to 13th December 2003 at Finchley Methodist Church Hall, under the direction of Mike Sparks. Despite the charm of Fairy Harmony (the enjoyable Emma Brown) and the commanding evil of Fairy Discord (the excellent Judith Shrank), I am far from certain that the prologue worked as intended. The Fairy Queen (Margaret Johnson) as a disembodied voice coming out of the ether was not really convincing, although she did turn up in person late on in the show. The panto which followed was up to the Guild Players usual standard with Alan Jobson again making the Dame's role his own, opposite Squire Clarence Creep played by Guild Players regular Laurie Heatherington and a shining new comer in Paul Manel as Billy Goose. Michelle Nymphe had the right figure and approach to her part as Colin (the Principal Boy). She gave the production pace and vigour along with Kirsty Lincoln as a coy but likeable Jill Goose, the village belle. The age old combination of little and large worked again with Lynda Gordon and David Constable as Sage and Onions, the Squire's bailiffs, and the programme revealed that the Goose contained Victoria Harris. Cecilia Briginshaw, Bill Davey, Ari Gnanamuttu, Ann Hefford, Mari I'Anson, Jennifer Lewis, Stewart Shrank and Paul Sparks made certain that chorus scenes were full. Ari and Jennifer also featured with the Principals in some of the dance routines created by Choreographer Kelly Rubin. Songs selected seemed to fit characters - maybe a few newer numbers would not have come amiss. The choruses were bright but some of the dancers lacked a sense of certainty about what they were doing. The stage sets were first class productions from local artist Mari I'Anson. The production scored highly on the music front with a six-piece band led by Musical Director Carole Catley. 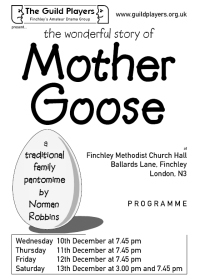 I see a number of amateur pantomimes each year and, all in all, for a Company who see themselves as actors who sing, rather than singers who act, I think the Guild Players did a convincing job on both fronts with their Mother Goose.